Now in its sixth printing, the second edition of this best-selling, pioneer publication is full-format (8.5 X 11) and fully illustrated with nearly 1000 images in a blaze of color! 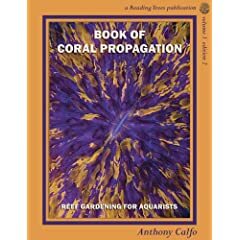 The Book of Coral Propagation is the most comprehensive work on the care, display and cultivation of reef corals at every level of interest. Beginners receive thorough guidance, expert aquarists learn new tricks, and all folks are inspired to contribute with enjoyment to the conservation, keeping, and culture of magnificent reef creatures in educational home aquaria and commercial systems alike. Topics include a thorough and easy to understand explanation of system designs, inspiring displays, no-nonsense setting up, easy water chemistry, feeding, species selection, health and wellness... and finally how to successfully prune and propagate your thriving coral garden! Anthony Calfo's lifetime efforts practicing and mentoring on this subject are legendary. Written in his famously entertaining if not humorous style, this book has been revised to have the most current and comprehensive information among any reference today for reef aquarium hobbyists. The superb photography, heavy photo paper and sewn-case hardcover binding of this reference make it a collectible as well as definitive work. A must-have for reef enthusiasts! PROFILING SOME OF THE MOST BEAUTIFUL and bizarre animals that make their way into marine aquariums, this second entry into the bestselling PocketExpert Series covers more than 500 species and groups of special interst to reef aquarists.